Preheat oven to 450°F. Place cauliflower in a large bowl and toss with olive oil and salt. Divide cauliflower between two sheet pans and spread out evenly. Roast for 10 minutes, then flip cauliflower and continue roasting for another 10 minutes until it’s caramelized and slightly crispy (but not burnt). While cauliflower is roasting, melt butter in small pot over medium heat. Cook for 3 minutes or until lightly browned and fragrant (it will smell nutty), shaking pan occasionally. Use a wooden spoon to scrape the brown bits from the bottom of the pot. Remove from heat, whisk in lemon juice, honey and raisins, and season with salt and pepper, to taste. 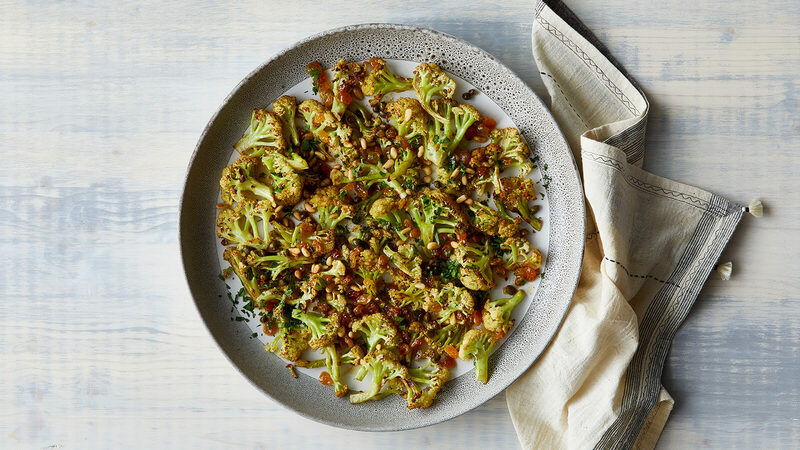 Allow raisins to plump up in the warm butter while cauliflower roasts. Once cauliflower is finished cooking, remove from oven and arrange on a platter. To serve, drizzle with butter mixture and sprinkle pine nuts, capers and parsley overtop.